It’s that time of year! 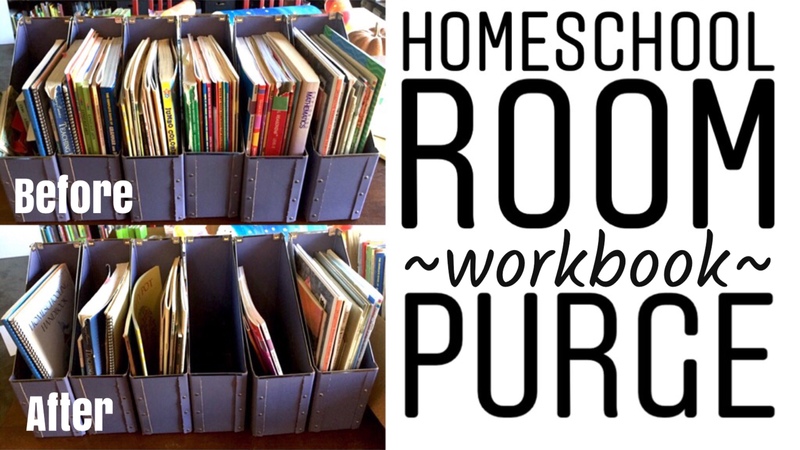 It’s time to clean out the homeschool room and make room for new material and new inspiration. Aside from the more laborious tasks of cleaning and dusting, purging is fun, freeing and motivating. Even if you don’t get rid of a lot of stuff, just going through your materials and refreshing yourself with what you have is a good idea. Today I focused on workbooks. Over the years, I’ve accumulated a lot of workbooks. Some I purchased, but most I got as hand-me downs from friends or other homeschooling families. I usually remove the pages of the math and grammar workbooks and place them in a three-ring binder for my children. They do one page each of grammar or math worksheets in a grade level below where they are at. This work is easy, independent and keeps what they’ve learned the year before (or more) fresh and sharp. I place nine dividers in the binder and label them “Month 1” through “Month 9”. Then I add 20 worksheets for each month from a random assortment of workbooks. You can see how I did that for this year (2017-2018), by checking out this video in which I show you the process I go through for assembling our daily binders. The binders have worked really well for several years, but the year before last, I decided to change things up and try putting our daily work into folders. It worked well for a short period of time, but ultimately required too much maintenance. I’ve been following you for sometime now and have learned quite alot from you. Thks for keeping things fresh and interesting.